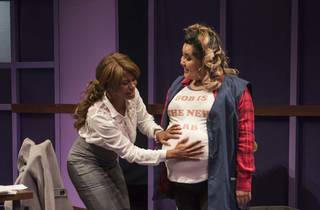 Antoinette Nwandu’s ‘Pass Over’ follow-up is a comedy in a more conventional key. 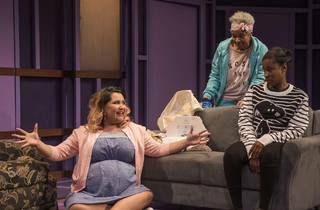 For those who saw Antoinette Nwandu’s play Pass Over last summer at Steppenwolf (which was a whole thing), it might seem surprising that BREACH: a manifesto on race in america through the eyes of a black girl recovering from self-hate is from the same playwright. 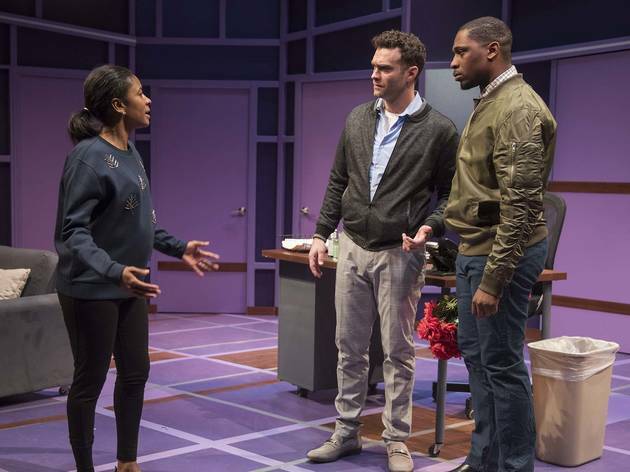 While the two plays share some broad, ballpark themes—like the difficulties African-Americans face in navigating a society that’s made by white people, for white people—they are about as different stylistically as two pieces could be. 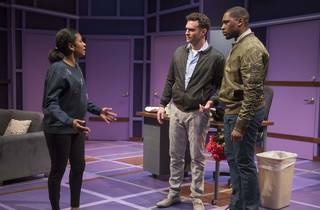 Pass Over was a brutal, expressionist reboot of Waiting for Godot with a narrative driven by acts of god. Breach, on the other hand, and despite the more fanciful title, is a straight-down-the-middle piece of comic realism. 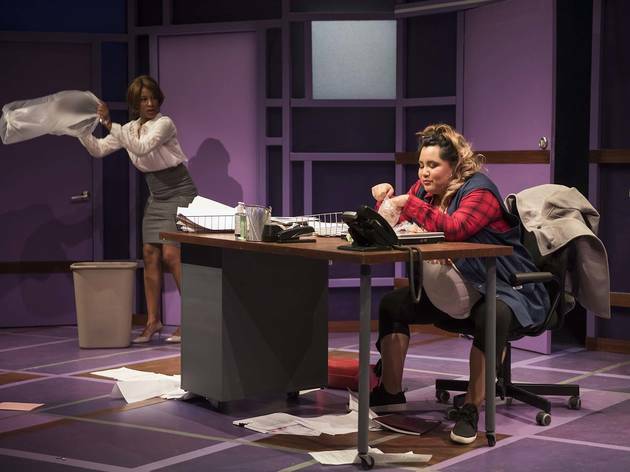 While it plays around with the conventions of romantic comedy and has its share of sober moments, it’s ultimately a very conventional play. 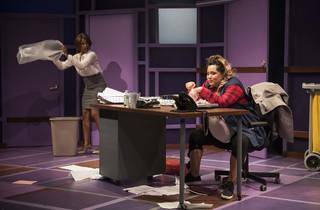 The titular black girl is Margaret, a stressed-out faculty member at a community college. 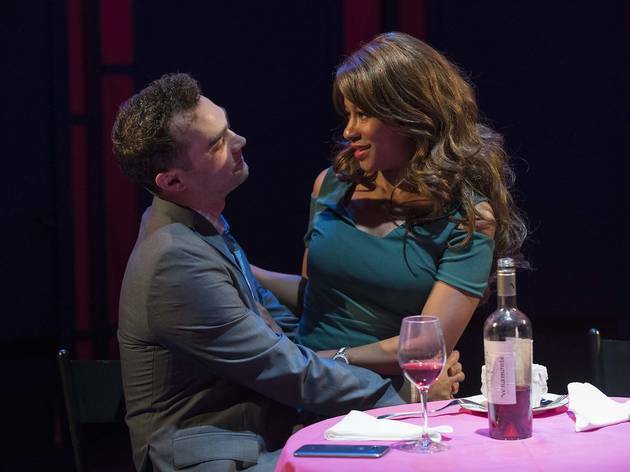 She’s got straightened hair, a white boyfriend who works in finance and an almost theatrical distrust of hope, change and black men. She’s the kind of person who refuses to be disappointed, and so refuses to believe in anything besides herself. At the story’s outset, Margaret (Caren Blackmore) has been passed over for a promotion in favor of Rasheed (Al’Jaleel McGhee), an earnest, capital-T eacher. Rasheed also happens to be an ex-convict, and Margaret is convinced that’s why he got the job. 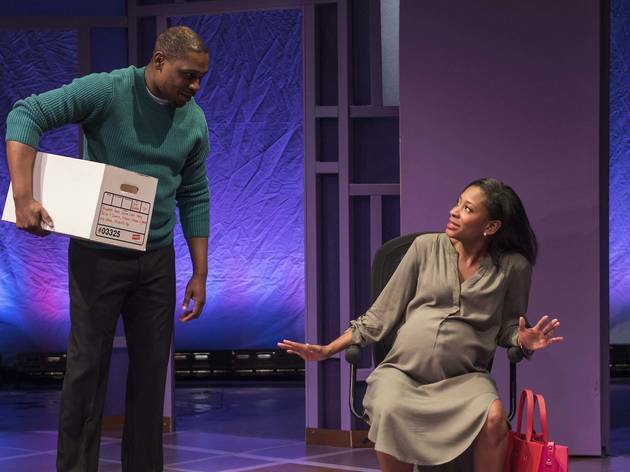 Meanwhile, her capital-Bro boyfriend Nate (Keith D. Gallagher) treats her like the trophy that he’ll win for “hitting his number” at his finance job, and her great-aunt Sylvia (Linda Bright Clay) is living in Margaret’s apartment and refusing to do anything her niece tells her. 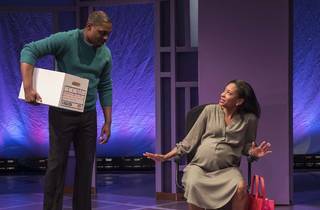 This all changes when, in the play’s second scene, Margaret and Rasheed unexpectedly hook up in their shared office and she gets pregnant. She refuses to tell him about it, and worries about how (or if) she’ll break the news to Nate. 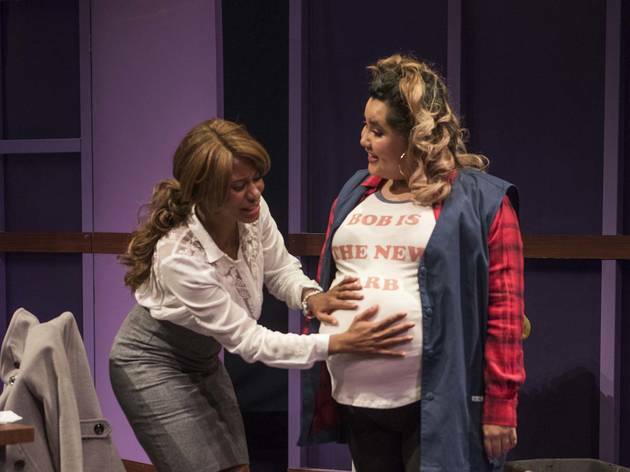 The only person who seems to have unsympathy is Carolina (Karen Rodriguez), the ballsy, also-pregnant Mexican cleaning lady whom Margaret befriends at her job. 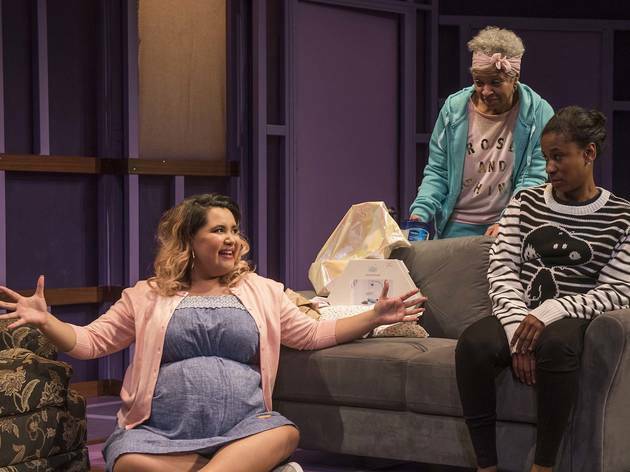 By the end of Act I, Margaret’s carefully constructed world—one she built on a flimsy foundation of self-hate and distrust—has come crashing down in ruin around her. Act II is where she actually starts recovering. And that means facing down Aunt Sylvia and the generational hardness that was passed down between them. Nwandu traces out this journey with clarity and grace, examining that tipping point when self-defense becomes self defeating. She also resists giving into romantic tropes like the idea that partnering is necessary for completeness and that relationships can be defined by big, lightning-strike moments. This proves to be a double-edged sword: The plot can can surprise, but it can also wander and flag. The play feels about 30 minutes too long. It’s very funny, sometimes absolutely hilarious, but there’s also a lot of dead air. Some of that air can be chalked up to Lisa Portes’s staging at Victory Gardens, which features two dynamite supporting performances from Clay and Rodriguez but lacks a compelling design and any real chemistry among the three sides of its central love triangle. Rasheed spends the entire play chasing after Margaret, but the lack of spark between McGhee and Blackmore make it a chase performed in concrete shoes. The most flammable moment amongf the three is when McGhee and Gallagher square off against each other for Blackmore’s affection. Victory Gardens Theater. By Antoinette Nwandu. Directed by Lisa Portes. With Caren Blackmore, Al’Jaleel McGhee, Keith Gallagher, Karen Rodriguez, Linda Bright Clay. Running time: 2hrs 10mins; one intermission.